The best Halloween I ever had occurred a little over a decade ago. I was living with my sisters in a large house just outside of Las Vegas, and we’d joined efforts to transform the front yard into a terrifying treat. We’d constructed elaborate gravestones for the lawn, adorned the porch with spider webs and multiple Jack-o’-Lanterns carved with devilishly scary faces, set out a cauldron flooding over with the sublime of dry ice, and compiled hours of spooky MIDI files to finish the mood. The finished product had been horror-film worthy, the reactions it evoked worth every hour we’d put into it. I can’t properly express the joy I felt when I answered the door to an adult male in street clothes, who shared that his child refused to approach the house yet insisted upon receiving candy from the scariest house in the neighborhood. What we see in horror fictions are scientifically impossible wants; they are not the right sort of things to test our authority over our feelings. Nevertheless, the imagery of the Undead does combine many elements of legitimate anxiety. First, there is the prospect of death. Halloween spectacles of the Undead invite us to confront the fact of death itself. I remember when I was around twelve or so and my family took a vacation to visit relatives in Washington. Somewhere along the way, there was an amusement park called The Enchanted Forest. The Enchanted Forest had a year-round walk-through haunted house, and I couldn’t wait to test my wits against it—and it proved to be one of the most terrifying encounters I’ve experienced. Around every turn, something or someone was there to pop out, grab, or scream at me through the dark. The exit was a hidden door in a nearly pitch black room, and by the time I found it, I was desperately ready to get the hell out of there. Incidentally, during that same trip at that same amusement park, a stranger came up behind me, grabbed me in a bear hug, and tried to drag me off. I’d been looking over the railing of a foot bridge, watching kids go down a massive slide below, and my would-be kidnapper said, “Come on; you want to go on the slide, don’t you?” I jabbed back my elbows backward, breaking his hold, while impulsively yelling, “No, I don’t!” He was off me in a matter of seconds, and when I turned to get a look at him, he’d run off and disappeared into the crowd. The event was terrifying—enough to put me in tears—but I remember my encounter in the haunted house just as vividly. The physiological reactions between the two were strikingly similar, although the emotional ones were not. While mentioning this might do nothing more than point out the obvious, it also highlights an aspect of humanity that is a bit harder to grasp and lay out so clearly: We are all, to one degree or another, obsessed with our own demise. Consider the popularity of classic horror writers such as Shelley and Poe and the imagery that just their names evoke. While Poe is also known for his detective stories (and he even wrote some bizarre humor) his popularity stems from the depth of his dark and Gothic works—nearly all of which revolve around death, murder, or perceived hauntings from beyond. Even those who profess not to be horror fans will recall with some satisfaction passages from “The Raven,” “The Telltale Heart,” “The Fall of the House of Usher,” or “The Cask of Amontillado.” When we think about Shelley, Frankenstein is likely the first story to creep into our minds. My favorite story of hers is “The Mortal Immortal: A Tale,” a story that is about the value we place on life, the fear we all share about death, and the meaninglessness life would hold without death to set that value. The approach both of these authors take appeals to our core fears and forces us to face our personal vulnerabilities. And the feelings and fears we choose to face when reading horror fiction overlaps the drive we horror writers have to create it: We wish to share our fears in the best way we know how, which is through fiction. Through writing, we are able to unload our personal bogeymen, pick them apart and figure out what makes them so scary, and then hand them over to whomever is willing to take them on for themselves. In turn, we elicit those fears in others, offering them a chance to face them in the safest ways possible. So perhaps it was the horror writer in me that enjoyed that one Halloween and that scary haunted house so profoundly. Perhaps it was just the human in me doing what humans cannot help but do. Whichever of the two is more accurate, both hold true in important ways. Death and the fear of death drive us on multiple levels—from mundane philosophical musings to the real and imagined horrors we all experience in one way or another. As much as we seek it out, we only do so in order to fulfill our desire to cheat it in whatever means possible. TODAY’S GIVEAWAY: Leigh is giving away one paperback copy, Jane the Hippie Vampire, Volume 1. Comment below or e-mail membership@horror.org with HH CONTEST ENTRY in the header. 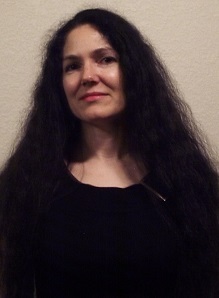 LEIGH M. LANE has been writing for over twenty years. She has ten published novels and twelve published short stories divided between different genre-specific pseudonyms. She is married to editor Thomas B. Lane, Jr. and currently resides in the outskirts of Sin City. Her traditional Gothic horror novel, Finding Poe, was a 2013 EPIC Awards finalist in horror. Her other novels include World-Mart, a tribute to Orwell, Serling, and Vonnegut, and the dark allegorical tale, Myths of Gods. She recently released Love Beads, Flashbacks, and Hair, the first three novellas in her dramatic urban fantasy horror series, Jane the Hippie Vampire. For more about Leigh and her work, visit her website at http://www.cerebralwriter.com, “like” her on Facebook at https://www.facebook.com/AuthorLeighMLane, or follow her on Twitter at https://twitter.com/LeighMLane. She stopped and turned at the sound of a terrified cry followed by gunfire. Screams echoed through the forest. A few more shots rang out. More screams. The cops, easily a half mile behind her, had crossed paths with someone or something that wasn’t intimidated by uniforms or firearms. It had to have taken them by surprise while they’d still been in pursuit. Had the timing been at all different, it might have been her who’d been under attack, and that was a shame. Self-defense was always the best way to go about killing prey, and she was hungry enough to eat just about anyone right now. The last people she wanted to see were those two cops, but still she backtracked. If they’d been attacked, she might salvage the night with a couple of saved lives and a good meal. The sight she came upon threw her back with equal parts disgust and surprise. The two men—or what was left of them—lay sprawled beside one another, their bodies twisted and broken. Blood was everywhere. Whatever had killed them had done so with extreme violence, literally tearing them limb from limb, their faces frozen in whatever terror had loomed over them in their final moments. One man’s intestines had spilled out through a massive gash to his stomach. The other’s throat had been torn out. Muscle and flesh and viscera glimmered in the patchy moonlight. Jane jumped when the gutted officer moved with a short but heavy moan. Their eyes locked, and he gaped at her with a measure of desperation only shared by those who know they’re dying and those who wish to be put out of their agony. She moved to his side, careful not to lose vigilance of any threat that might still be looming nearby. Carroll, Noël. “The Fear of Fear Itself: The Philosophy of Halloween.” In The Undead and Philosophy, ed. Richard Green and K. Silem Mohammad (Chicago: Open Court, 2006), 233. A fascinating and thought-provoking post, Leigh. The near-kidnapping experience must have been terrifying.